King's Best in Show win made him the 15th Wire Fox Terrier to earn the top title at Westminster. The breed is the winningest at Westminster, followed only by the Scottish Terrier, which has eight wins. It’s good to be King. 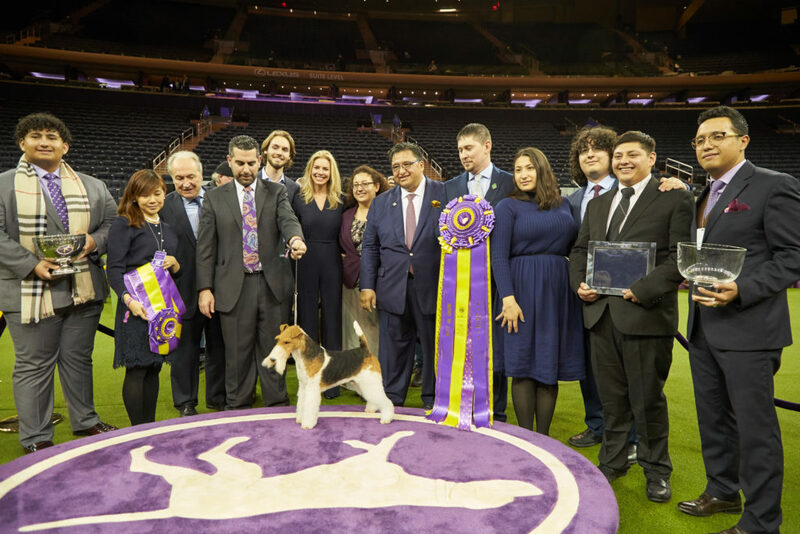 On Feb. 12, the Wire Fox Terrier Grand Champion Kingarthur Van Foliny Home was crowned Best in Show at the 143rd Westminster Kennel Club Dog Show, presented by Purina® Pro Plan® at Madison Square Garden in New York City. The victory was nothing if not dynastic: Wire Fox Terriers are the winningest breed at the famous Manhattan dog show, which is the second-longest-running continuous sporting event in America after the Kentucky Derby. King’s win brings the breed’s total number of wins to 15 at Westminster. Back in the middle of the huge, green-carpeted ring, handler Gabriel Rangel accommodated a phalanx of photographers and videographers as King climbed into the sparkling silver trophy to strike still more poses. Rangel is no stranger to Westminster’s Best in Show ring: He won in 2014 with still another Wire Fox Terrier, a female named Sky who, like King, was owned by Victor Malzoni Jr. of Brazil. But King’s win is a “very significant one,” Rangel noted, because of the expertise of the man who judged it. In the dog-show version of runner-up, Reserve Best in Show went to a Havanese named Bono (Grand Champion Oeste’s In the Name of Love), which was the first time the national dog of Cuba has won the Toy Group at the Garden. Two-year-old Bono, who is named after the U2 frontman, was shown by Taffe McFadden, whose husband Bill won Best in Show at Westminster last year with Flynn the Bichon Frise. Madison Square Garden’s spectators are invariably vocal about their preferences, and from the cheers and chants, it was clear that two low-slung contenders had stolen their hearts: Burns the Longhaired Dachshund (Grand Champion Dual Ch. Walmar-Solo’s OMG SL JE) and Bean the Sussex Spaniel (Grand Champion Kamands Full of Beans @ Erinhill), who returned to the big ring after winning the Sporting Group at last year’s show, too. The other group winners were Baby Lars the Bouviers des Flandres (Grand Champion Quiche’s Major League), Wilma the Boxer (Grand Champion Cinnibon’s Bedrock Bombshell) and Colton the Schipperke (Grand Champion Rivendel’s Barefoot Bandit), who after taking a lap around the ring to acknowledge his win was cordially dismissed by judge Green. While the Schipperke’s exit may have confused onlookers, such recusals occur periodically at dog shows, where pre-existing co-ownerships and business relationships, no matter how remote, might present a perceived conflict of interest. In fact, earlier in the evening, before he began adjudicating the Sporting Group, judge Doug Johnson excused the Clumber Spaniel and Welsh Springer Spaniel because he had bred them both. As for Rangel and King, their post-Westminster plans were pretty basic: “We’re going to hug a lot of people and feed the dog,” Rangel said, followed by a bath for King and a good night’s sleep for both. In short, the royal treatment.